During the summertime, we find ourselves drinking more iced tea, especially in the afternoons. Starting with this month and continuing through summer, the teas we select for our Tea Clubs are great for either hot or cold brewing. Fill a pitcher or large glass with cold water. 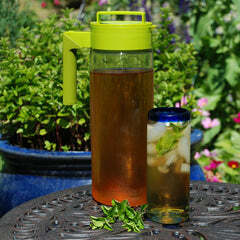 Add 1 teaspoon of loose leaf (1 tablespoon for whites or “flufflier” teas) for every 8 ounces of water. Use a tea infuser, paper tea filter or a pitcher with a built-in tea infuser (all available at lizzykate.com). Place in the refrigerator for 6+ hours (we do ours the night before and let it sit overnight). Remove the tea leaves and enjoy some great cold tea! 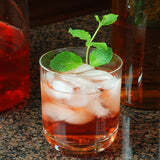 How does cold steeping work? Just like with hot steeping, the water molecules “bump” into the tea and the flavor is released. In hot water, the molecules move faster and it takes less time for the flavor to come out. An advantage of cold steeping is that less bitterness comes out of the tea and you may find cold brewed teas are smoother and sweeter. Note: for herbal blends, dried flowers and fruit, it’s recommended to rinse the tea with boiling water before cold steeping because these are not usually heated during processing like tea leaves are. You can check out more of our favorite teas to cold brew and cold brew pitchers in the Cold Brewed Tea collection.